In a small series of islands in the Aegean Sea lies the tiny gem of Mykonos Island ? a dreamy destination that thousands of visitors from around the world. Mykonos Greece is probably the most cosmopolitan of the Aegean Islands. It is a wonderful kaleidoscope of cosmopolitan shops, beautiful beaches, pulsating nightlife, quaint windmills, homely taverns and ancient churches and digs. A beautiful sight to behold is row upon row of whitewashed buildings with door frames and window shutters highlighted in sky blue and jade green. The streets are a maze of narrow, winding alleys with pink and purple blossoms on the balconies of all the buildings. Take a tour of Mykonos and explore its unique appeal. 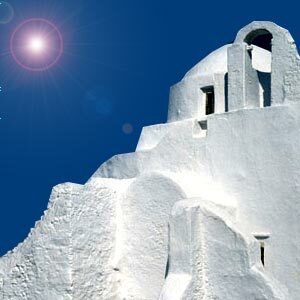 Mykonos can be reached from Athens airport in about 30 minutes. During summer, there are direct charter flights to Mykonos from several European cities. The airport at Mykonos is about 4 kms from the town. You can also travel on ferries from Athens, Thessaloniki, Dodecanese and Crete. Mykonos has a well-organized bus system. You can also rent a car and explore Mykonos. You can also use the Caiques to visit most of the beaches. The caique service is highly seasonal though. Excursion boats to Delos depart on all days except Monday from the west side of the harbor. The weather of Mykonos is typical of the Cyclades Island weather with mild winters and dry summers and infrequent rainfall. The sun is constantly shining and the sky is blue and clear. Don?t forget to carry your beach wear and sun protection kit. Visitors can choose from a range of accommodation including star hotels, villas, studios, apartments, pensions, self catering units as also gay and lesbian hotels. Wining and dining is the national pastime of the Greeks and Myconos is no exception. The city is home to many restaurants and tavernas which serve delicious traditional dishes and fantastic cocktails and drinks. Sample from the exotic moussaka, kabobs, pastitsio, stifado or paidakia and top it up with ouzo (an anise flavored liqueur). The Scala Gallery is one of the best galleries in town with works of many well-known artists displayed here. There is also a selection of jewelry, sculptures and ceramic pieces. Scala II Gallery is located nearby wherein the same art pieces are sold at reduced prices. You can also buy hand-woven scarves, rugs and tablecloths from around Greece. Mykonos is also famous for its jewelry shops which sells jewelry in classical, Byzantine and natural motifs. Mykonos Island is the most popular island for gay and lesbian holidays, as it offers an extensive range of gay friendly hotels and beaches. There are exciting gay bars and clubs and special gay entertainment. Popular gay beaches include the Paradise beach, Super Paradise Beach and Elia Beach. Mykonos is definitely the ideal holiday spot for both gay couples and singles. Mykonos is filled with beaches lined with stylish caf? bars, restaurants and tavernas. The Ornos beach, just 10 minutes bus drive from Mykonos is one of the popular sandy beaches. It is known for water sports and luxurious tourist installations. Platys Yialos is the most popular beach of Mykonos with 600 meters of sandy beach lined with umbrellas and sunbeds. The beaches of Paradise and Super Paradise are exactly what they promise ? sheer paradise. The beach of Psarou is the gathering spot of the rich and the famous with their sailing boats and yachts. Enjoy the sunset from the fascinating Alefkandra, also known as the ?little Venice of Mykonos?. Visitors can also rent jeeps and tour the hidden corners of the island. One can also take a one day cruise where you can relax and enjoy some of the quiet beaches of the island. A must see is the Agricultural Museum with its traditional windmill, Nautical Museum with its beautiful ship models, old maps and the old light house. You can also visit the Folklore Museum, which is located in a beautiful 11th century building. Cine Manto is an open air caf? cinema in the heart of the town and is open from June to September. The site includes some lovely gardens. You can also play golf at the Beach Golf Club, enjoy diving at the Mykonos Diving Club and windsurf at the Surf Center. No trip to the island is complete without visiting Delos. Delos was the most important Panhellenic sanctuary and the birth place of Apollo and Artemis. Delos is included in the World?s Cultural Heritage and protected by the UNESCO. Large scale restoration work has been undertaken and several columns have been rebuilt and ancient houses have been roofed to protect these ancient monuments. Some of the important monuments include The Temple of the Delians, The Minoan Fountain, Terrace of the Lions, Temple of Isis, Temple of Hera, The Theatre and The House of Dionysus. Mykonos has the liveliest and varied nightlife in the Aegean. It is a bar hopper?s paradise with various types of music including rock, pop, classical, American, European and Greek being played. When the sun goes down, the town comes alive. The party starts with a toast to the sunset in Little Venice and continues through the night at all the dance clubs and bars.